(CNN) -- Roger Federer and Andy Murray eased into the quarterfinals of the Madrid Masters with straight sets victories on Thursday. Federer was in impressive form as he cruised into the last eight of the Madrid Masters. 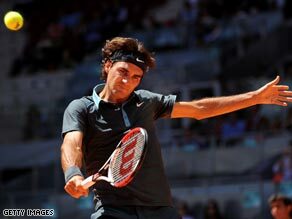 Second seed Federer was close to his best form on the Spanish clay to beat 14th-seeded American James Blake 6-2 6-4. Earlier, fourth seed Murray showed his improvement on the slower surface with a 7-5 6-1 beating of Spanish 16th seed Tommy Robredo. Murray, who is the defending champion from when the tournament was played on a fast indoor surface last autumn, finally converted on his eighth break point in the 11th game of the first set. The Scot will turn 22 on Friday and enjoyed an early birthday celebration as he swept through the second set with breaks in the third, fifth and seventh games. He was satisfied with his day's work against an accomplished clay court player player. "Robredo is a top-10 clay-court player I think," Murray told the Press Association. "He's been to the second week of the French Open quite a few times and has won tournaments on clay. I was a little bit tense early on. I had a lot of break points and didn't take them but I started to swing a bit freer in the second." In Friday's last eight, Murray will play fifth seed Juan Del Potro of Argentina who beat Swiss Stanislas Wawrinka 4-6 6-4 6-4 in a lengthy battle. Meanwhile, top seed Rafael Nadal and American Andy Roddick later also reached the last eight without hitting a ball -- after their scheduled third round opponents pulled out with leg injuries. World number one Nadal went through after German Philipp Kohlschreiber was forced to pull out, while sixth seed Roddick enjoyed the same gift when Russian Nikolay Davydenko pulled the plug before their scheduled late-night encounter. Third seed Novak Djokovic completed a clean sweep for the leading players, easing to a 6-4 6-4 success over Italian Andreas Seppi. In the women's third round, top seed Dinara Safina defeated Lucie Safarova 6-0, 4-6, 6-3 while Serbian number four Jelena Jankovic reached the last eight beating Russian qualifier Elena Vesnina 6-2, 6-2. In the third round of the accompanying WTA tournament in Madrid, fourth seed Jelena Jankovic of Serbia reached the last eight as she beat Russian Elena Vesnina 6-2 6-2. She will be joined by top seeded-Russian Dinara Safina, who was made to fight before getting past Czech Lucie Safarova 6-0 4-6 6-3.